Hey there. Remember me? It’s been a month and I have lots to update you on so let’s get started. It was mine and Christy’s eighth year and one of the best weather-wise. As Christy said, it was cool enough to wear our sweaters but warm enough not to need to cover them up with a coat. And it didn’t even rain on Friday. It almost always rains the Friday before. The question that I’m sure is on everyone’s minds is Did you finish Sugar Maple? I sure did! I only have one crappy photo so I’m going to hold off on an FO post until I do a photo shoot. 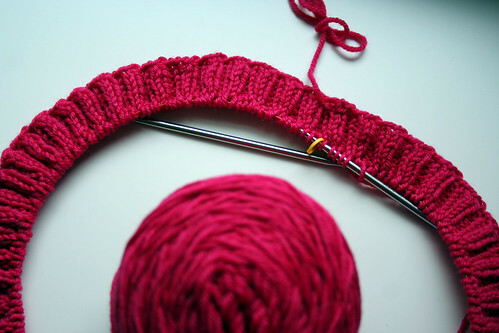 But I love everything about it – the yarn, the fit, the colors – everything. 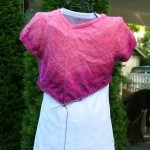 And it’s gotten me jazzed about garment knitting again. 7 skeins of Shelridge Farm Soft Touch DK in Lipstick. Yep, another perfectly pink shade for me. This one is going to be a Wrapped Pullover but I’m doing it in DK instead of Aran weight. A sweater as heavy as Aran just isn’t practical for me – and I’m sure it’s also not very flattering. I think I’ll get a lot of wear out of it in DK and it’s a good thing too. With the yarn weight change I need to knit a 50 to get a 36. 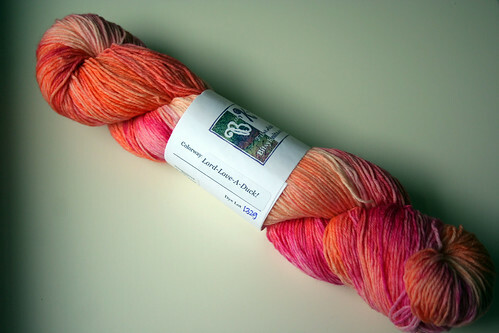 The other yarn I got is another skein of Sock82Me in a much more cable-appropriate color – Lord-Love-A-Duck! 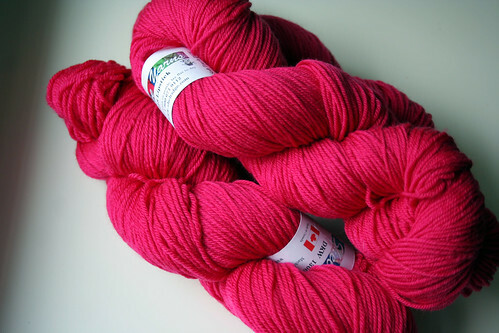 It has my pinks in it with a healthy dose of orange – a shade I’d like to use more of in my knitting. No idea which pattern I’ll do but I can only get this at Rhinebeck so I didn’t want to miss out. Then, there was casting on. 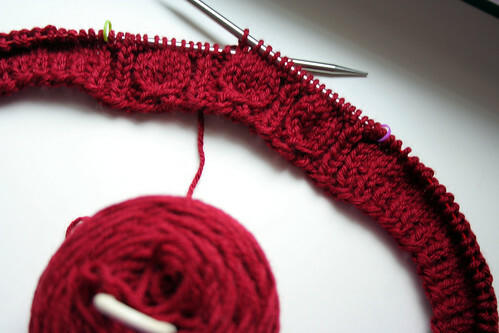 I started my Wrapped Pullover – it’s just to the ribbing. And then, I cast on for Elisbeth. Again. This time in an even smaller size. And finally I admitted to myself that I need a pair of fingerless mitts to wear at work. I’m cold All. The. Time. and there’s no freaking way I’d allow myself to buy a pair of squeaky acrylic mitts. I wanted something that covered my wrists and went up a bit on my forearm. 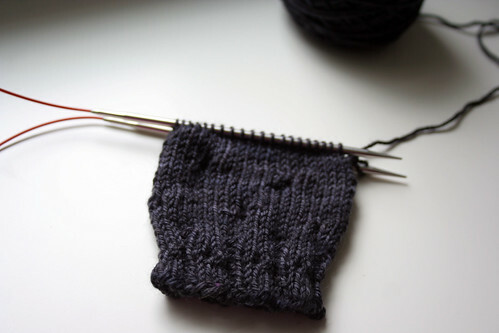 And I wanted simple so I can wear it with just about anything and for a while I was considering just doing a pair of stockinette mitts. But then I got an email about the Mirri Mitts by Ambah and I knew they were the ones. They’re almost as simple as st st but have little dots of eyelets to keep it interesting to knit and a little something special to wear. And there was some Etsy buying. 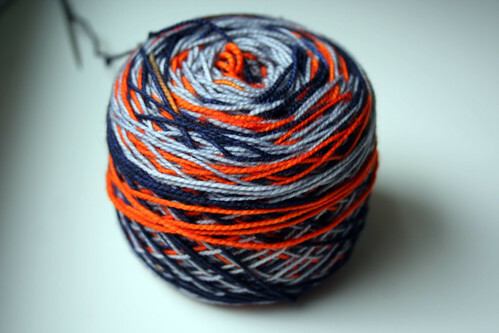 I got a skein of custom ordered stripes in Chicago Bears colors for Paul from Ladybug Fiber Company. 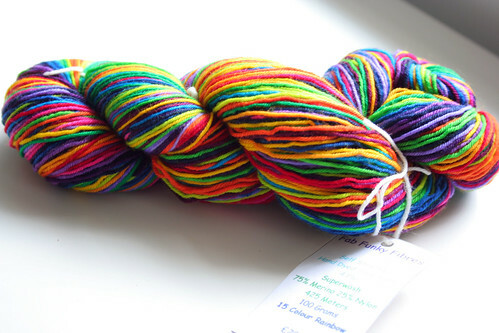 And a skein of 15 Colour Rainbow from Fab Funky Fibres. I don’t want to interrupt the stripe sequence so I’m thinking afterthought heel. I love the little bullseye that heel forms but it’s not my favorite for fit. So we have the classic form versus function question. I think form will win out on this one. And finally, a little something for you. There’s a big group of indie designers participating in the Indie Gift Along that are offering discounts. I got the Mirri pattern for 25% off. Take a look at the whole list. There are TONS of designers offering discounts – some I recognized and some there were new to me. 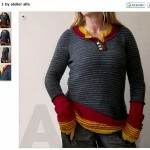 The GAL is a win win – support indie designers and get a great pattern out of it. festivals and shows, WIPs - 2013, yarny goodness. permalink. Oooh, a DK weight Wrapped sounds like a nice idea. Will you have to re-calculate things for the arm area, or does it work out with the larger size/smaller gauge? Is the 15 color rainbow also self-striping? I’ll have to check in again on that shop–right now they’re sold out! 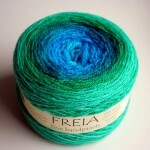 Love the great yarn acquisitions. Maybe more than love, as the self-striping yarns have me drooling. Sounds like the weather and everything else was on your side this year. a beautiful garment finished and more on the needles. Life is good. You’ve got some nice sweaters going there. did you ever finish your Color Affection? I finally completed Sothia and am going to tackle mine. Yay! 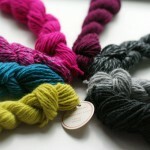 Such lovely yarns! I especially like the Lord-Love-a-Duck colorway and weight! The Wrapped Cardigan will be gorgeous in that color! Seeing you cast on all those things is giving me a case of start-itus. And I can’t wait to see your Sugar Maple. It looked great when we last saw it…. and it wasn’t even done yet! Glad you had fun! Love the yarn purchases. I had quite a bit of purchasing fun on Etsy, too. Now if I just had the time to actually finish the four projects I have right now and start new ones. And yes. It is COLD at work. I swear the A/C is on rather than the heat. The fingerless mitts will come in handy if you want to practice boxing with all the hanging meat you can store in the freezer boxes of offices we have.